Unfortunately, none of the multiple attempts were successful, but they established a relationship between Ripan and myself. Ripan and I were trying to figure out this week just how long ago that was and we think it was about 10 years. We know it was more than 7 years, since he has been at the University of Illinois since 2006 where he established the Malhi Labs, and it was significantly prior to that. After finishing his PhD, Ripan founded a company called Trace Genetics. It was there that I first met Ripan. They specialized in ancient DNA processing. 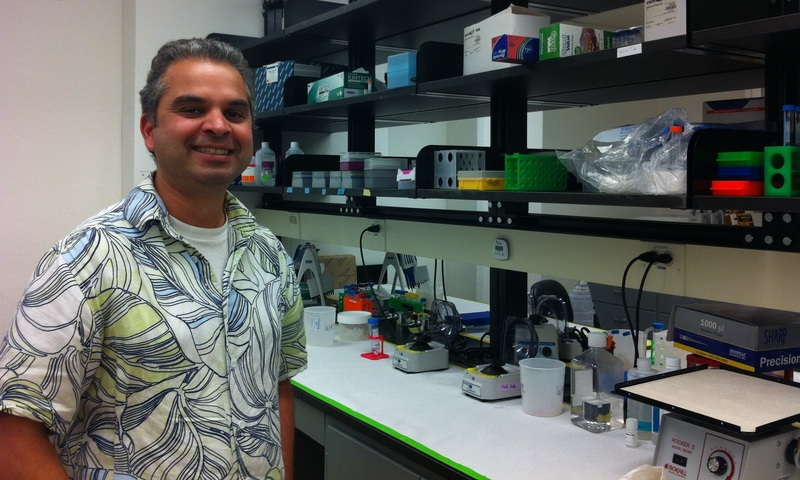 A few years later, in 2006, Ripan sold that company and established both the Malhi Ancient DNA Lab and the Malhi Molecular Anthropology Lab at the University of Illinois where he is an Associate Professor. Ripan has a long list of publications to his credit. It won’t surprise you to discover that Native American and ancient DNA are both areas in which he specializes, and in particular, ancient Native American DNA. Dr. Malhi was very gracious during my visit to the University of Illinois and agreed to show me both of his labs. Not only that, he came to the Native American House to get me so that I wouldn’t get lost navigating the campus and delivered me back as well. For that, I’m extremely grateful! A campus with 40,000 students isn’t a campus, it’s a city and parking is almost non-existent! First we visited the Ancient DNA Lab. This lab is separate from the rest of the processing, and is actually in a different building altogether. Access is extremely limited and only those who need to go inside, do. I’m not one of those people. Why such limited access? In a word, contamination, the arch-nemesis of ancient DNA processing. Ancient DNA, by definition is old, degraded and generally in short supply. The process of extracting it from whatever medium you are working with, teasing out whatever is left, without introducing any outside contamination, is tricky at best. Limiting the exposure in the room itself is the first step in a series of protocols designed to limit, prevent and then identify contamination if it exists. The room is double air locked and pressurized so that when someone enters or exists the air is blown out and none of the surrounding air enters the lab. The room itself can accommodate two researchers. 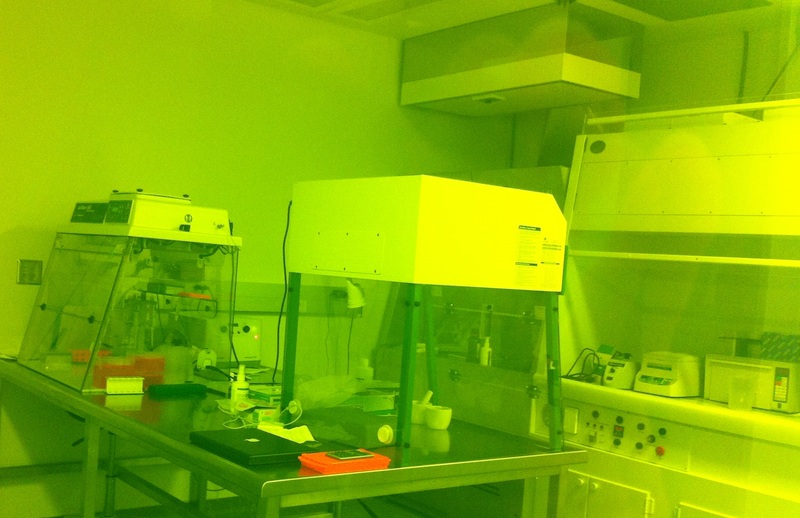 The window is tinted yellow as the lighting is also controlled within the lab. So if these photos look yellow, it’s because they are. 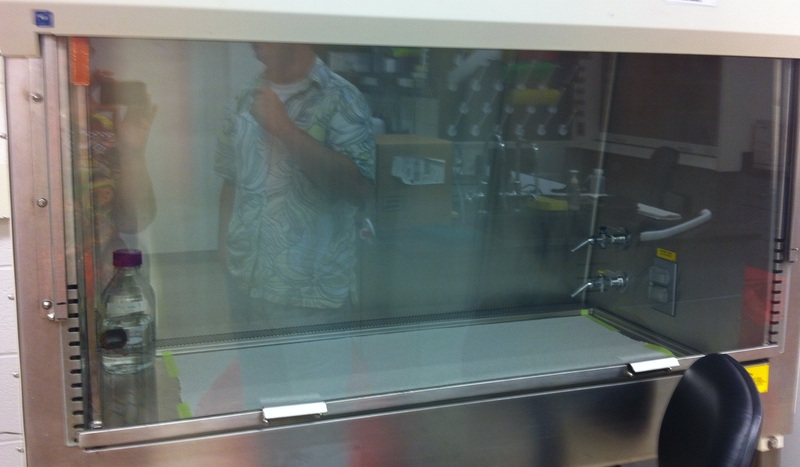 You can see the DNA extraction area in this photo. Work is done inside a cubicle, again, to limit contamination. You can see the mortar and pestle used to sometimes grind the materials. Other times, such as with teeth, drills are used. After the DNA is extracted and amplified, assuming DNA is found, and it’s not contaminated, the results are then taken to the second lab, down the street, for processing. This is the Molecular Anthropology lab where most of the people work, since they deal only with already extracted ancient DNA or contemporary DNA. Contemporary DNA is considered a medical hazard while the DNA is still in a body fluid of some type (saliva, blood, cheek swab), so medical precautions must be taken. 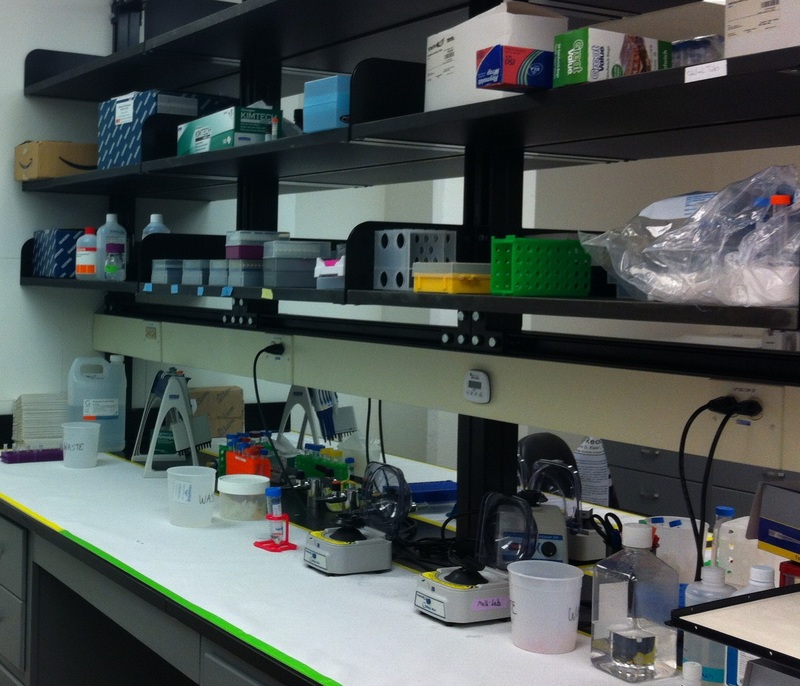 In many ways, this lab looks just like a lab at a medical facility. In fact, it’s in the Medical Sciences building. DNA is extracted from contemporary samples in this work area. After extraction, it is no longer considered a medical hazard, so from that point forward, only normal lab protocols are in force, not medical biohazard protection. The DNA is then further processed in this area. Ripan discussed some of his current projects as we toured. He continues his work on Native American population genetics, and in particular, the migration and settlement of the Native people on this continent. Currently he collaborates with Canadian tribes and is involved with an ongoing project to analyze the remains of several hundred Native burials that have previously been discovered. Not only does he work with Native population genetics, and remains, but he also encourages Native American students to join his programs and work in the labs. He works closely with the Native American House. I’m hopeful that Ripan’s projects and ongoing analysis will bring some answers to questions like whether or not mitochondrial haplogroup X is found in any tribes west of the St. Lawrence Seaway (inferring that it did come from Asian, not Europe), whether haplogroup M is found in the founding Native population and whether European or African haplogroups of any description are found pre-Columbian contact in the Americas. I want to thank Dr. Malhi for his hospitality, for making time for the tour this week, and to wish him Godspeed in his continuing research. And yes, that does mean I want him to hurry. That hasn’t changed in the past decade! This entry was posted in Ancient DNA, Anthropology, Education, Population Genetics, Research and tagged General Information by Roberta Estes. Bookmark the permalink. I have a handful of hair from my grandmother when she was sixteen. Is it possible to derive DNA from that even if it’s cut? (I’ve heard that you need the roots). You need a hair follicle to even stand a chance, and even then, it’s less than 50%. Amazing!!!! 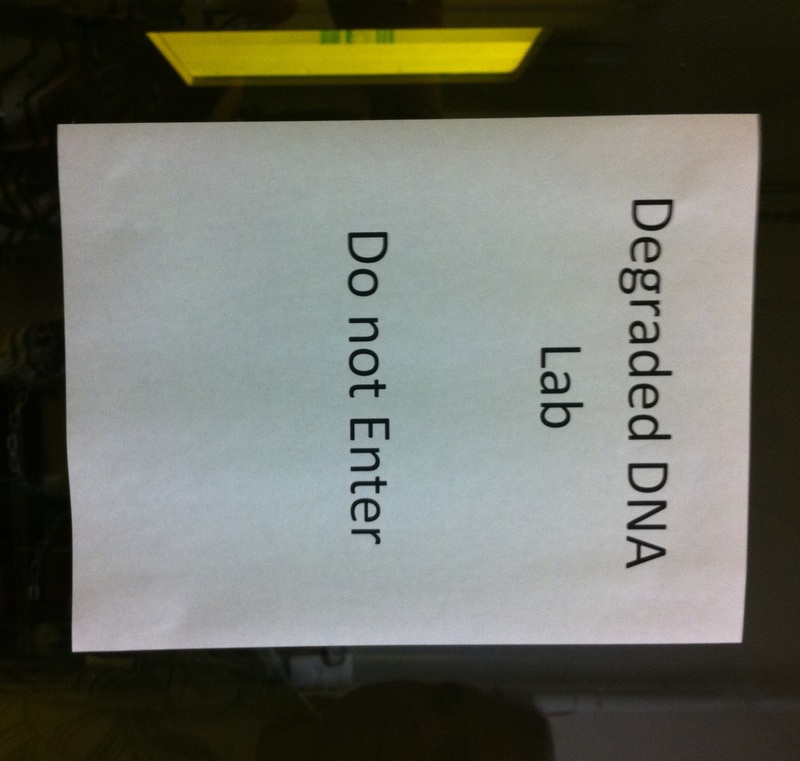 Thanks for sharing this story, and, probably the only ‘DNA Lab’ access we’ll ever have. So the question now that begs answering is ‘who/what lab is the ‘leader’ in Native American/Indigenous etc. testing with the most samples to pull from? Thanks again for this latest info! You could test yourself using the Family Finder ethnicity test. If this is your grandfather and he was half Indian, you should be approximately 12.5% Native. Secondly, you could test one of his sons or other males who carry the surname. Third, if he had sisters, you could check the mtdna of someone who descends from the sisters through all females. I am an Indian student and currently working on an Ancient DNA project. My samples contain degraded DNA, i tried extracting Ancient DNA but not 100% successful. I would like to know whether you can help me anyway in analyzing my samples. Roberta, this is a very interesting article. His field of studying Native American DNA is fascinating, and it would be nice getting periodical updates on his research! I am hoping that major strides are made on ancient DNA. I too am Malhi, there a very few of us about.. I would love to find out how close Dr. Ripan and I are in the family lineage. Contact him. He’s very approachable. I will do so.. ty.. I did recognise the nose.. its quite distinctly Malhi from the Sialkot region just off Kashmir!! I have a tooth from my father. Can it be a source of dna for ancestor research? Where can it be done and how much? It depends on its condition. Contact Family Tree DNA and ask. They do some of this type of extraction.